A monument to Symon Petliura, who fought for Ukrainian independence after the 1917 Russian Revolution, and under whose leadership thousands of Jews were killed in pogroms, has been opened in the city of Vinnitsa in western Ukraine. The sculpture was erected in the courtyard of the building that formerly hosted the Ministry of Post and Telegraph of the self-proclaimed Ukrainian People’s Republic, which was headed by Petliura in 1917-1921. The Ukrainian nationalist icon is portrayed sitting on a bench with a map of the country in his hands. 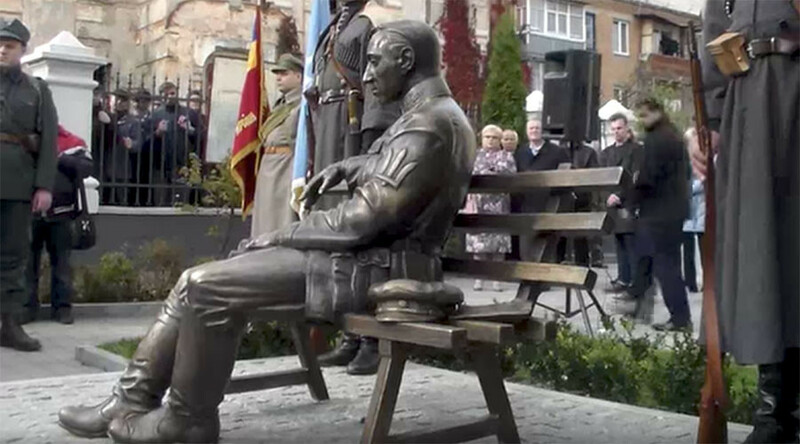 The Vinnitsa authorities unveiled the monument on Saturday, when the country marked the Defender of Ukraine Day – a new holiday ordered by President Petro Poroshenko in 2014. “He was a man who sincerely loved his country, his native language, who tried to be honest with his own people,” Valery Korovy, the chairman of the Vinnitsa Region administration, said of Petliura, claiming that the Soviets did everything to “malign this honest man,” as cited by Ukraina.ru. It is the first monument to Petliura in Ukraine, which previously only had a bust erected in the capital, Kiev, and a memorial sign in Poltava. Petliura fought for Ukraine’s independence from Soviet Russia, following the October Revolution of 1917. During his time as the head of the Ukrainian People's Republic, between 35,000 and 50,000 Jews were killed in a string of pogroms. After his cause failed Petliura fled to Paris, where he was killed in 1926 by a Ukrainian-born Jewish watchmaker, Sholom Schwartzbard. Despite Schwartzbard being caught red-handed, he was later acquitted by a French court, which ruled that he was acting in the heat of the moment after 15 of his relatives were killed in the pogroms. Petliura’s apologists claimed he was personally against the pogroms, but lost control of his armed forces who engaged in killing Jews. Schwartzbard’s defense and some historians, however, hold Petliura directly responsible as the head of the government who did nothing to prevent them as he wanted to avoid a spat with his forces. The monument was unveiled while hundreds of Ukrainian far-right radicals held a torch march in the center of Kiev on Saturday. They celebrated the 75th anniversary of the establishment the Ukrainian Insurgent Army (UPA) – a nationalist paramilitary group that actively collaborated with the Nazis. Since the collapse of the Soviet Union, the Ukrainian authorities have been facing criticism over their attempts to glorify controversial nationalist figures, including those who openly sided with the Nazis. In 2000, they awarded ‘Hero of Ukraine’ titles to Stepan Bandera and Roman Shukhevych, who collaborated with the Nazis during World War II and were involved in mass killings of Jews and Poles in Volhynia and Eastern Galicia. The decision was later annulled under condemnation from the European Parliament, but Bandera and Shukhevych still have monuments and streets named after them across Ukraine.